These are general reference books that were released by third parties relating to the Japanese watch industry. 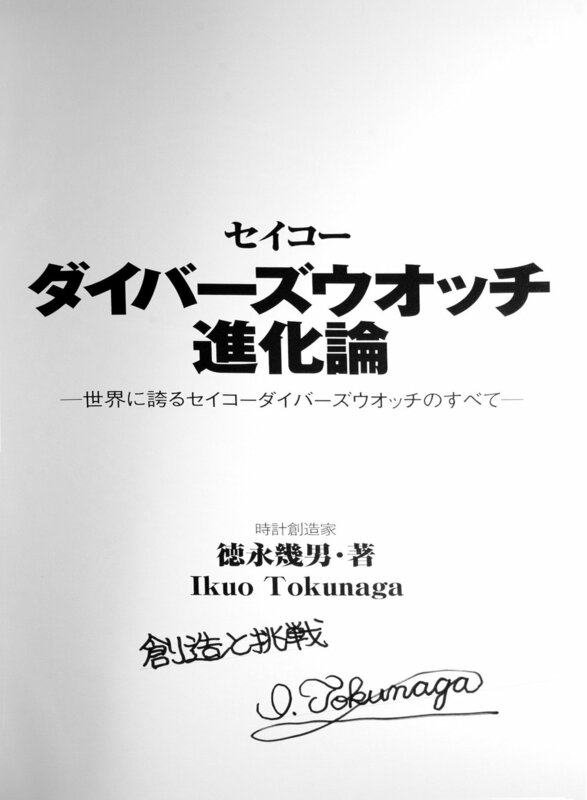 Content: This book was written by Ikuo Tokunaga one of Seiko’s most famous engineers who developed a lot of special watches such as deep-sea diver's watches, pilot watches, adventure watches, railway watches and so on over a span of thirty years. The book covers many of the special watches from Seiko and how they were developed and evolved. Comments: Excellent exploded diagrams, family organization charts and great insights into the design process for the wide range of special series of watches. Even without reading Japanese this is a book worth checking out. Content: This book is written by famous Seiko designer Ikuo Tokunaga who was responsible for many of Seiko’s developments with watch design. The book is focused on the evolution of the divers watch and the different technologies that were created for this specialized field of watches. The book is broken down into the following chapters. Comments: The book contains numerous design drawings and exploded diagrams showing the watches construction. 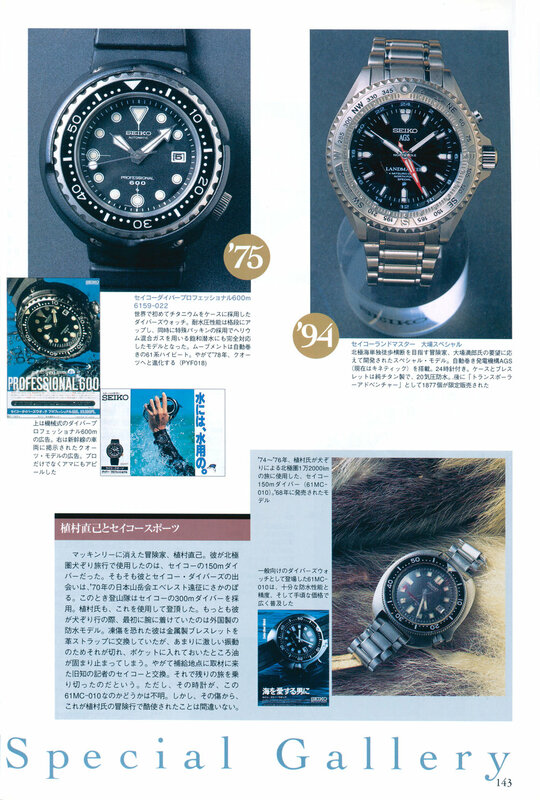 There are also a number of tables detailing the different diver models produced by Seiko over the years. 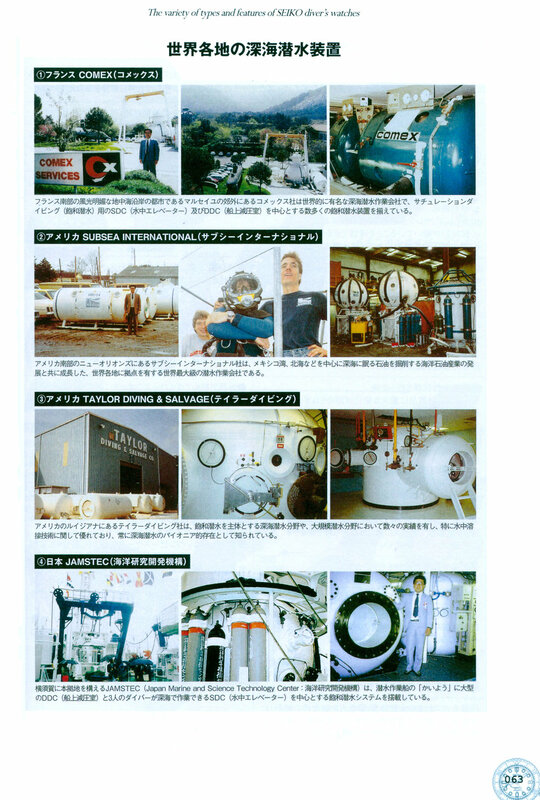 While written just in Japanese the book has many pictures and diagrams that are of interest. There is a very small amount of information that is repeated from the previous “The Story of Evolution on the Special Watches of Seiko” book but most of the information provided is new. I would love to see an English translation of this book released at some time, but even if you cannot read most of the text there is a lot of useful information that can still be gained from this book. Content: The full Seiko history with chapters on Grand Seiko, Marvel and Cronos, Seiko Quartz, Kinetic, Design, Seiko Sports with lots of pictures of watches, advertising, schematics and Seiko people. 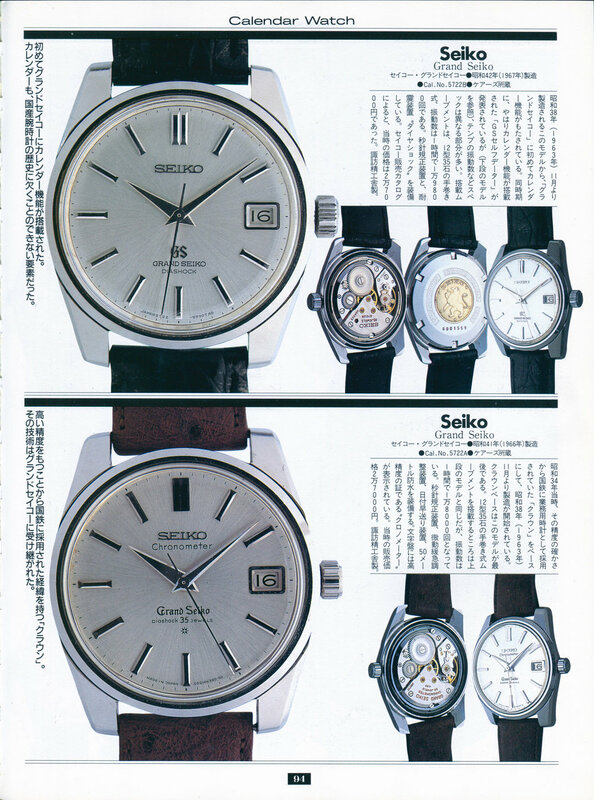 Comments: This is an excellent reference that covers many different areas of the history of Seiko. Some of the sections are reproduced in the book “A Journey in Time”. There are lots of large well shot images and this is worth acquiring. Content: The book is divided into the following chapters. 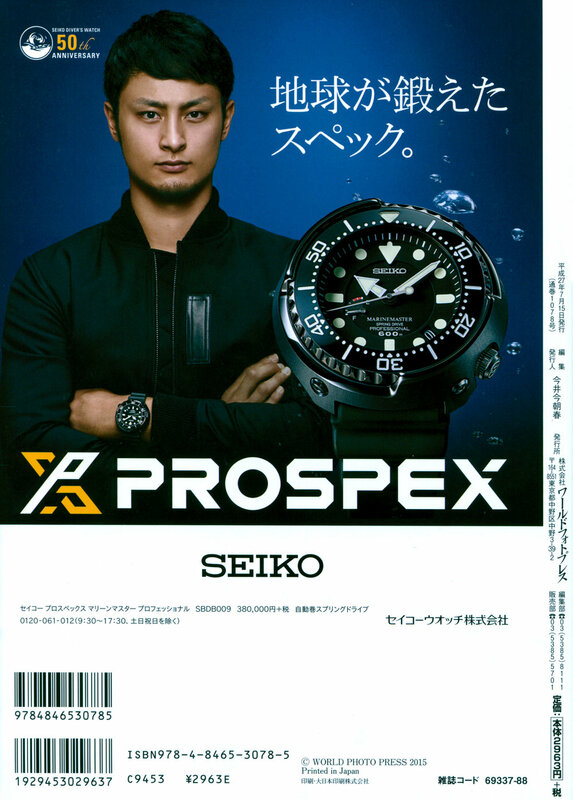 In each chapter they examine watches from Seiko, Citizen, Orient, and Takano. Each watch traditionally has a face shot as well as a case back and movement with the back removed. There is a small amount of text for each watch as well as movement and release date. The back of the book also has a short section showing the current ranges from Seiko, Orient, Casio and Citizen at the time of printing. There is also a section showing adverts for 32 different second hand watch dealers. Comments: There is limited specific information on each watch but the images are clear and there is a wide variety of watches presented. 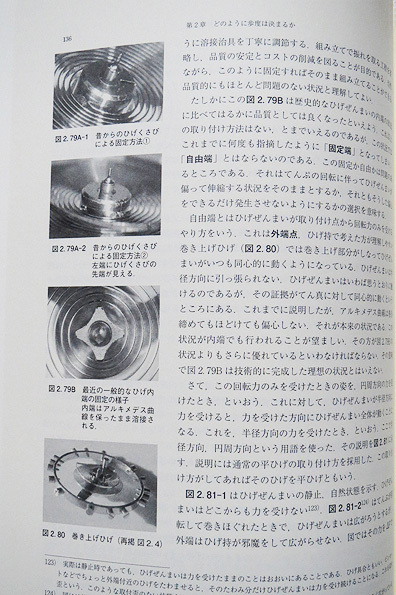 At the start of the book there are four pages of English text on history of Japanese watch makers. 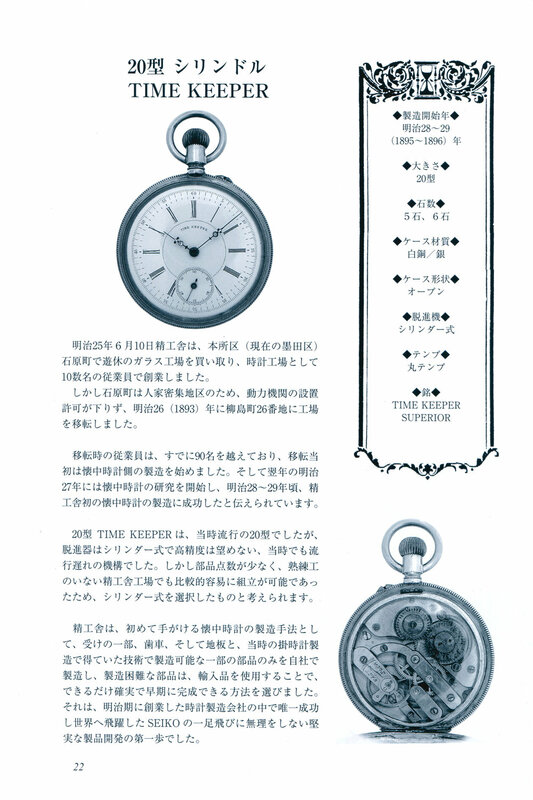 Content: This book shows Seiko pocket watches from the start of the company until the end of the 1920’s. The book has many pictures of the various watches and they are divided into different periods and then sections such as military watches or railroad watches. The book starts with the beginning of Seikosha, then the history of pocket watches of Seikosha. Following chapters cover the Meiji pocket watches, Taisho, Showa, pocket watches, Seikosha before and after the war. Comments: This book seems to be the best resource for information of the early pocket watches from Seikosha. There are lots of sections describing the differences between models and the things to look at when comparing the different models. There is also a large amount of information that makes it possible to confirm the exact movement types and to help date specific watches. If you like early Seikosha pocket watches then this book is recommended. Content: As expected from the title this book is a biography of Kintaro Hattori from his early years through to the formation of Seiko and his legacy. Comments: This is a pure text based biography and unfortunately of little use for non-Japanese readers. Comments: This is a reprint of the 1993 book “Kintaro Hattori - The man who built a kingdom Seiko”. 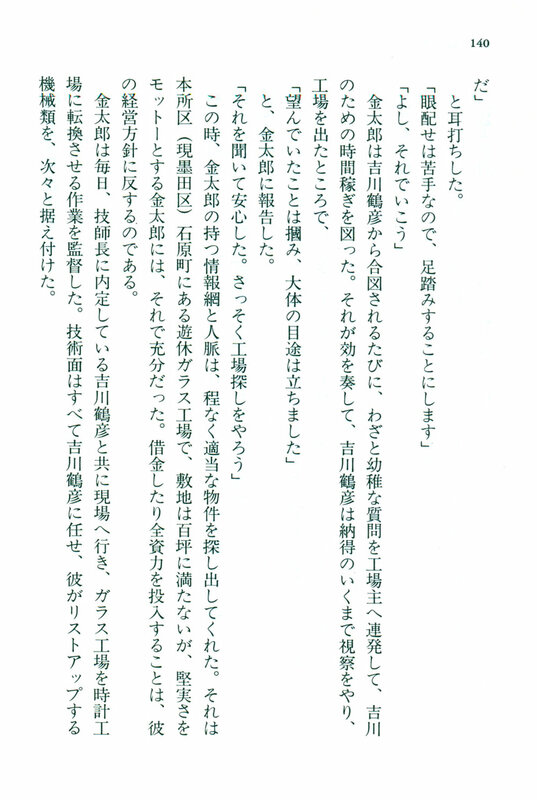 This issue is also pure text with no images provided and is of little use for non-Japanese readers. Content: This book focuses upon the business practices that helped Citizen fight back against low cost competition and build the company to the powerhouse it is today. The full title of this book is Can win in the world even in domestic production - Counterattack of Made in Japan - Citizen Watch DNA evolving with miniature, precision, packaging technology. Comments: This is a business book focused on the corporate decisions and not the actual watches, so do not expect a history on the development of Eco-Drive or any model specific details. 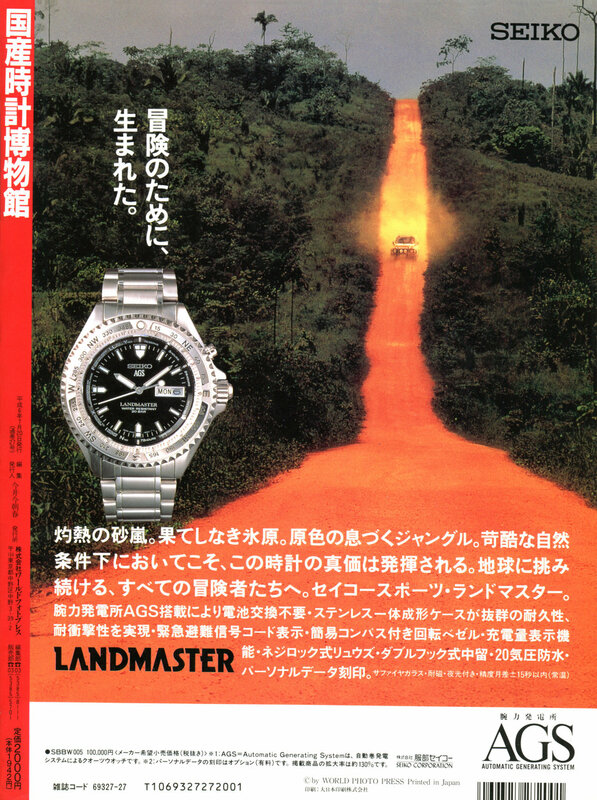 Content: This book examines how the Japanese watch industry coped with the quartz revolution and the very competitive market in the late 70’s. Casio’s fight, which will Win? Clock War that threw men? Does the retail store have a future? Comments: The book contains a small number of pictures and is almost all text. If you do not read Japanese I cannot recommend this book. Publisher: Rippu Shobo Publishing Co. Ltd. 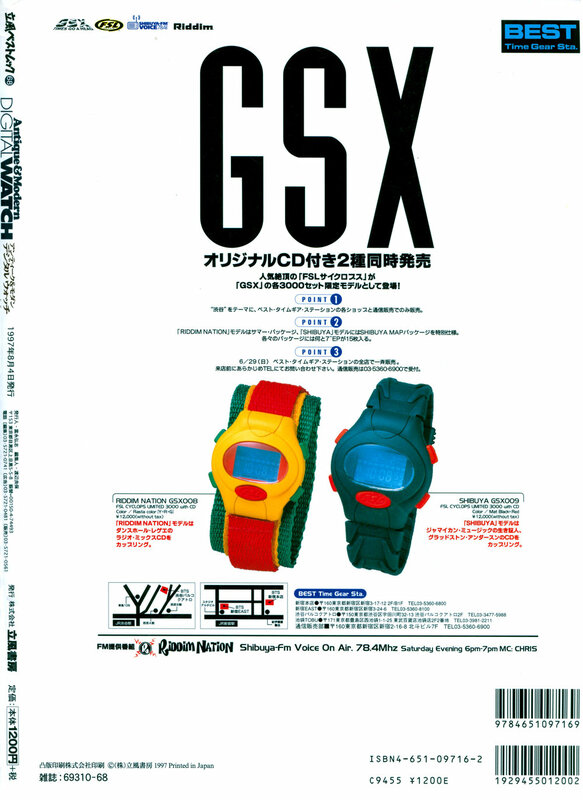 Content: This book is filled with large clear images of various digital watches mainly from Japanese manufactures. The book is arranged in roughly chronological order and watches are grouped into common areas. 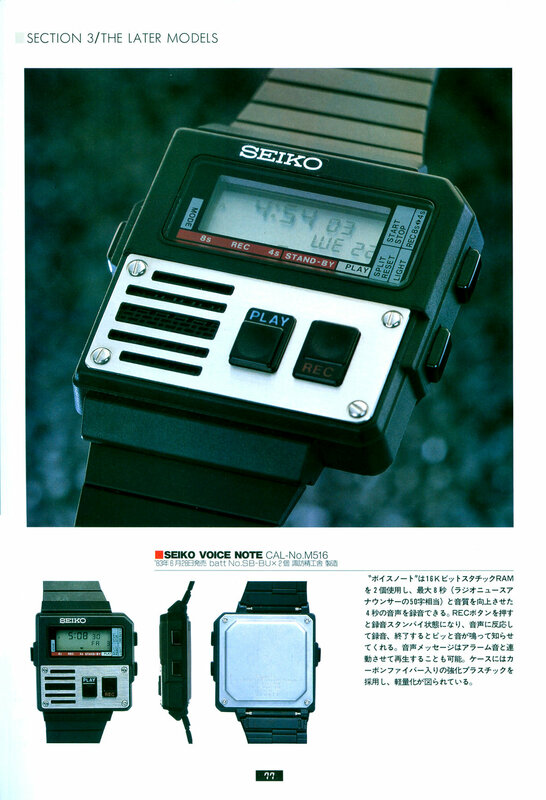 It starts from the first 6 digit LCD watch, the Seiko 06LC, and finishes around the early 1990's. There is also a section for LED watches and another section on toy watches. Comments: This is a nice overview of the early digital watches and contains lots of nicely shot images and some interesting information. Content: This is a collection of digital watch images that are presented with a small description next to each. Comments: The information in this book is minimal at best. There is little organization to the book and there are no real details provided on the watches presented. The models seem to be grouped almost randomly and are at best grouped into brands. There are a small amount of Seiko models displayed with more Citizen models shown and lots of Casio models. There is also a significant amount of early LED watch images presented. I would not bother getting this book unless you can pick it up for just a couple of dollars. Contents: Mr. Hajime Asaoka is Japan's first high-end independent watchmaker who has built a number of different watches including a tourbillon model. These watches are hand produced and the process of building this model watch is documented in this book. The full title of this book is Japan Made Tourbillon - Manufacturing in Japan that Challenged Ultra-luxury Mechanical Watches. Comments: The book outlines the inspiration, design and production process of the mechanism of the finished tourbillon watch. The book contains a large number of technical drawings and is a complex in-depth discussion of the issues involved. Without a fluent understanding of Japanese and a strong background in watch design the book will be of minimal interest to most readers. 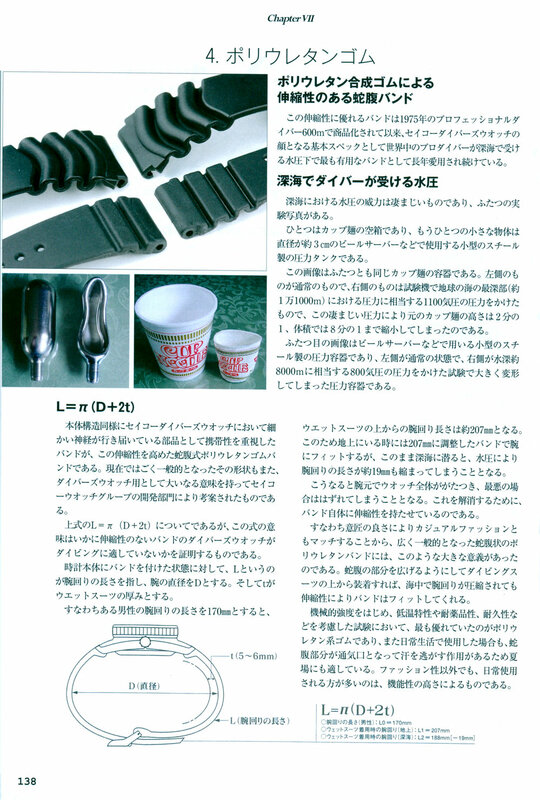 Contents: This is a reprinting of a serialized mechanical watch introductory course that had been printed in the Japanese magazine “The world of Watches". The course was written by Shoichiro Komaki who is a member of the Japan Clock Society and technology adviser. In 1958 Komaki-san joined Seiko and was involved in the design and research for watches. He was involved in the submission of the watches for the Swiss Observatory Competition and was also heavily involved in the development of Quartz technology. Comments: This is a highly technical book and due to the specialized nature of the contents would only be useful for native Japanese readers with a strong background in mechanical watch servicing and assembly. Content: There is a short history of timekeeping and then this book describes the basic principles of quartz technology as well as a section on how LCD’s and CMOS-IC operate. Comments: This book has a simple description of the technology and is not brand specific. There are a number of sections that specifically reference Seiko including a two page FAQ section at the end of the book. Due to the small amount of hard information contained in this book and the general nature of it this is not recommended. Content: The description for this book states that it contains a complete history of the Japanese watch industry, from the opening of the country in the 1850s to the present day. The analysis covers the main manufacturers of Japanese watches (Seiko, Citizen and Casio) as well as other types of players, such as the State, universities and collective research organizations. Comments: I have not seen this book but I have read that it does contain a wealth of interesting information. If you speak French this would be recommended. Comments: This book seems to examine the history of the Japanese watch industry and how the commercial markets have evolved. I am unsure how much information from the book "Catching Up and Overtaking Switzerland" is replicated in this book. Cover - Why are the hands of the clock clockwise? The beginning of the week is Sunday or Monday? Why are the clock hands clockwise? Why is the clock in the catalog pointing at 10:08? How much can the accuracy of the quartz watch be increased? How does the advancement of watch technology change sports? How did the pocket watch become a watch? Why did the American watch industry decline? Which shop is using a counterclockwise clock? How to increase the accuracy of hourglasses? How many seconds are needed to avoid aerial collisions? Is it possible to introduce daylight saving time in Japan? Is it true that you can live longer if it is an Islamic calendar? Comments: This is a short collection of topics that all relate to time. Each topic is covered in 2-4 pages. The book was written by Oda Ichiro who worked for Seiko for many years in the product management, sales planning and publicity departments. He was in charge of the planning and editing of the Seiko publication “A Journey in Time”.